My uncle and I arrived at LAX a few hours before our flight. I had scheduled a Global Entry interview for my Uncle (free with American Express Platinum) and that took place before we checked-in for the flight. While the economy class check-in line was packed, the business class / Star Gold line was empty. An odd occurrence at check-in: the agent insisted upon a return ticket before issuing our boarding pass. This has never happened in 50+ flights to Europe over the years and the rules are clear: we simply cannot remain more than 90 days during a six-month period. The rules do not require a return ticket. Since we planned to fly home in Lufthansa First Class using miles, our return space had not opened yet. Not wanting to delay us further, I quickly placed on hold a full-fare ticket from Frankfurt to Los Angeles and showed it to her. That did the trick. There was also a seating issue — we were moved from two windows to a center section as a “courtesy”. Problem: we wanted window seats. Sadly, it was too late–all seats had been allocated. We spent the next hour in the Star Alliance Lounge, which I have reviewed before here. Let’s start with the service. I took it after the flight. The crew was so friendly I could not help but to do it. Every member of the crew was charming, friendly, helpful, and courteous. They loved their jobs, were happy to be working, and it showed. 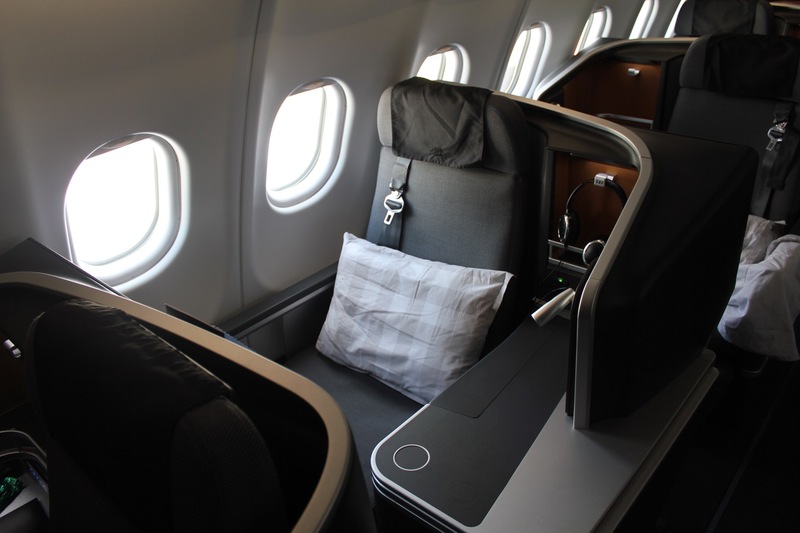 SAS features 32 flat bed seats in business class with a full 180º recline. Seats are arranged in a staggered 1-2-1 configuration using the Thompson Vantage XL seat. We took our new seats in 2D/F and tried to look at the bright side: at least we could chat during the flight. I loved the bight colors of the cabin and Hästens pillows and bedding. The seat is comfortable in upright, semi-reclined, and fully-reclined mode. The cabin was darkened after the first meal service, though mood lighting remained on until the lights were turned up for breakfast. Despite a 2pm departure from LAX, I was able to sleep for about five hours. Menus were distributed prior to takeoff. Pre-departure beverages were also offered, though only orange juice, water, or champagne. Service began promptly after the captain extinguished the seat belt light, about seven minutes after takeoff. I was first offered a warm towel. Next, the table was set for dinner, with a table cloth laid followed by a bread dish and utensils wrapped in a cloth napkin. A bowl of mixed nuts was offered. Trying to avoid jet lag, I had only sparkling water to drink. Service on SAS is via cart and FAs always entered the aisles in unison. The appetizer cart included two choices–veal loin or poached lobster tail. I chose veal loin. Salad was no pre-plated but rather dished out of a large salad bowl. The veal was excellent and you cannot go wrong with a green salad. But best of all was the bread: very fresh rye bread that tasted like it had been flown in from Stockholm. I chose swordfish for my main course (served with purple mashed potatoes and white asparagus). My uncle chose beef filet (with horseradish mashed potatoes and mushrooms). Once again, meal service was via cart so there are never meal orders taken on SAS. We both loved our main courses. Dessert included crackers/cheese, fresh cut fruit, lemon tart and ice cream. I sampled all four. Between meal service, a “kitchen” is set up in the business class galley in which you can help yourself to salty and sweet snacks, fresh fruit, and your choice of beverage. I tired to make a cappuccino myself and could not get the milk to foam. Thankfully a FA came to my aid! Breakfast was served only about an hour prior to landing. It seemed like the FAs may have lost track of time because the meal service went very quickly, but I was appreciative of the extra time to sleep. Orange juice was freshly squeezed and I also enjoyed Greek yogurt with muesli, an English muffin and citrus fruit. Moments later another cart appeared with various cold cuts and a hot egg dish plus sausage. Once again, everything was delicious and there was still time for one more cappuccino. IFE is controlled by a passenger service unit in the seat or by touch screen. There were two dozen English movies available and a worldwide cinema including Norwegian, Swedish, and Danish movies. Music, games, and TV as well. The IFE also contained an interesting history section, detailing the story of Scandinavian Airline Systems (SAS). There were also back issues of the in-flight magazine, which I have not seen on other IFE systems. Wi-Fi is complimentary for business class passengers, but I was unable to log on with my seat assignment and last name. Others appeared to encounter the same issue. The purser wrote down a password to use on a napkin and presented it to me. That worked like a charm and though the internet was not fast, it worked well for the duration of the flight. The amenity kit is very basic, with only socks, earplugs, a toothbrush, toothpaste, and skin lotion. It’s the first time I can ever recall receiving an amenity kit without an eye shade. Lavatories include a window and are stocked with additional “wet wipes” and a flowerless green plant. SAS business class is a solid product with great food and beverage, a comfortable seat, and good IFE + Wi-Fi. Perhaps I was particularly lucky (or others particularly unlucky) but I had an exceptional crew that made the flight amazing. Note that when redeeming SAS flights with Aeroplan there is no fuel surcharge, an added bonus to spending your miles on SAS. How do you sleep after all that coffee? Great report! For whatever reason, coffee does not have an adverse effect on me! Wifi was ok for me. My upgrade went through to LAX and WiFi was in and out in 1H. The upgrade didn’t clear on the return, and the WiFi was about the same in SAS Plus. Lastly, there was a medical emergency on the way from LAX to ARN, and the flight crew handled it very well and professionally (I was 1 seat away from the situation, so got the first hand experience). Kudos to SAS. I am happy too. Remote gates for widebodies are very annoying! When was this flight? Can’t possibly be August 10 2017……..
Perhaps. I flew SAS five times on this trip and had five good flights. Well, fair question but I don’t view a seat assignment as the same thing as seat itself. Plus, I was sick of dealing with the rude woman at check-in who demanded our return tickets and just wanted to get to the lounge and get some work done prior to the flight in case wi-fi did not work. I see… thanks for replying. Thanks for the up to date review. We are flying to Norway and the Faroe Islands for our 25th anniversary in September. IAD-CPH-FAE on SAS, OSL-BRU-IAD on Brussels, both in business with Aeroplan miles. It should be a fun comparison of 2 good TATL products. Sounds like a great trip! Enjoy it. You’re a good man. Me? I’d have lost my temper and all interest in the flight after dealing with someone who was unaware of the regulations, and had my seats reassigned. Did she at least apologize for the reassignment? Probably not. “Courtesy” indeed! I agree that this contract agent should be fired. I’m not sure she even worked for SAS. But my uncle tends to always be in a good mood so he is a good person to travel with — it rubs off. Flew SAS Business Class last month from IAD-CPH. Service was just as you reviewed here. Everything was top notch! My only “complaint” was the ability to get comfy when in the lie-flat position. I usually sleep with my legs bent, but because you legs recline under the seat in front of you, my waist down was VERY confined and I didn’t get any sleep on the overnight flight. I’d much rather have a seat that doesn’t extend under the one if front of it (like Lufthansa’s Business Class)…although the new SAS set-up is becoming the norm for most airlines in Business. Great review. We are flying SAS A330 Business class from Jacksonville, FL to Stockholm in a few weeks. Appreciate your review and photos.